The first examples of the Turkish Marine Assault Vehicle (MAV) - called the Zaha project - are to be unveiled at the IDEF Defence Exhibition to be held in Istanbul, Turkey, in May 2019, Jane's has learnt. FNSS Savunma Sistemleri and the Undersecretariat of Defence Industries (SSM) signed a contract in March 2017, to design, develop, and manufacture 27 MAVs for the Turkish Naval Forces Command's new landing helicopter dock (LHD). Four vehicles will be command post (CP) and armoured recovery vehicle (ARV) configurations - two of each - and the remainder will be configured as armoured personnel carriers. The MAV hull is a sealed, hydrodynamic design made of all-welded aluminium armour that can be bolstered with appliqué armour kits and boasts a self-righting capability. It has a combat weight of 30 tonnes and a maximum road speed of 70 km/h and 7 kt in water. Let's call this what it is. 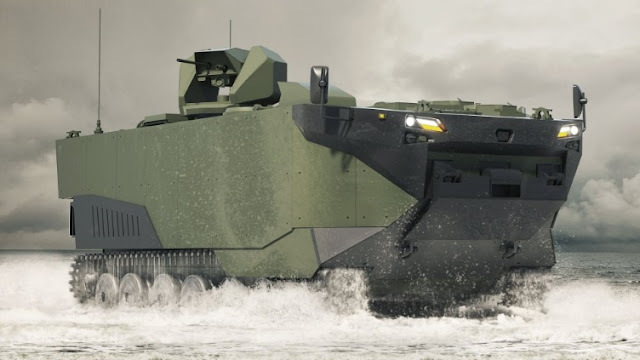 A modernized AAV that's been rebuilt for the 2020's and beyond. It would be like taking the basic design of the AAV we have in service, building it brand new with some new components to make it more reliable and capable. One thing is missing though. That means they're still going with bench seating. I guess the Turks aren't as worried about IEDs as we are. Additionally I see they aren't able to squeeze better water performance out of the thing. I didn't think we'd see a developmental dead end when it came to armor but we seem to have hit one with amphibious armored vehicles. You just can't make them faster in water without compromising land performance..and if you do then you're making it a maintenance hog. Regardless I can't wait to see what FNSS has done with the thing.